The DISCatcher Sport is a great practice basket, and it can also serve as a target for temporary courses, camps, schools and home. With just 5 parts, it assembles with the help of a screwdriver in about 5 minutes. 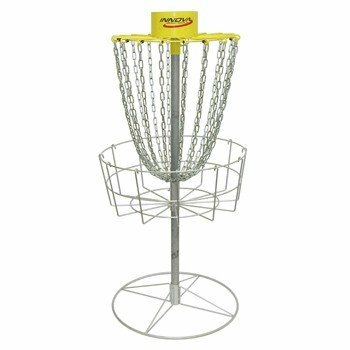 The DISCatcher Sport is PDGA approved for tournament play, and is fun for all ages! The DISCatcher Sport uses 18 strands of galvanized chain along the outside of the chain rack, which makes it one of the best catching practice baskets available. The DISCatcher Sport is not meant for permanent outdoor installation. Due to the size and weight of this item it can only be shipped within the continental United States. Electroplate galvanized finish on the Basket, Pole and Base. Durable yellow powder coated finish on the Top with a pre-attached chainset.